The satellite sent into space over the weekend in a controversial launch is now "tumbling in orbit," U.S. officials tell CBS News correspondent David Martin. It's the second time the North has tried but failed to put a satellite into stable orbit. North Korea actually claims to have put four satellites into orbit, but the first two have never been confirmed by anyone else. 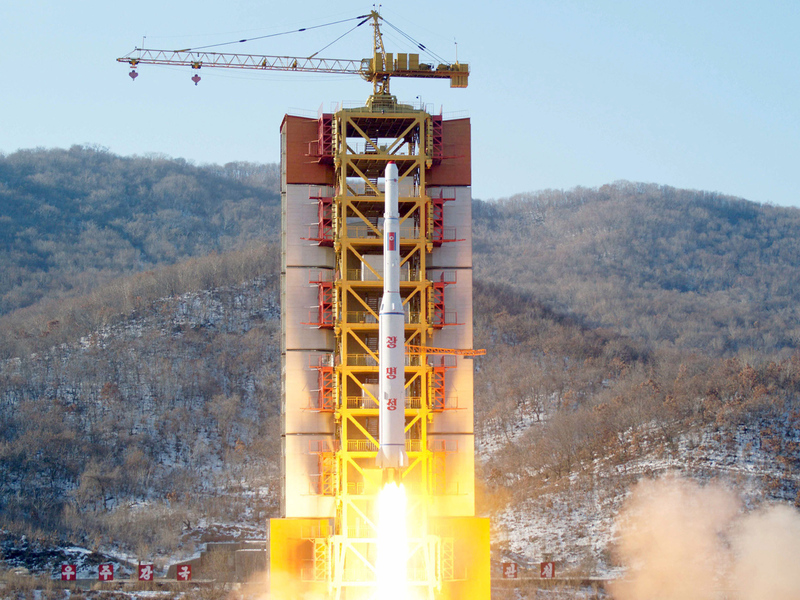 However, experts worldwide agree it got one into orbit in 2012 and NORAD, which is hardly a propaganda mouthpiece for Pyongyang, now has both that and the satellite launched on Sunday on its official satellite list. Kwangmyongsong 4, the satellite launched Sunday, has the NORAD catalog number 41332 and Kwangmyongsong 3-2, launched in 2012, is 39026. They are described as Earth observation satellites, and weigh about 220 pounds apiece. Whether they actually can achieve those purposes is another matter. The latest satellite is circling the earth at a height of about 300 miles in a roughly north-south orbit that took it over the Levi's Stadium in San Francisco about an hour after Super Bowl 50 ended. The international community condemned North Korea's long-range rocket launch, calling it a banned test of ballistic missile technology and another "intolerable provocation." The U.N.'s most powerful body pledged to quickly adopt a new resolution with "significant" new sanctions. North Korean leader Kim Jong Un went ahead with the launch just two hours after an eight-day window opened early Sunday, and a month after the country's fourth nuclear test. He ignored an appeal from China, its neighbor and important ally, not to proceed, and, in another slap to Beijing, he chose the eve of the Chinese New Year, the country's most important holiday. In a reflection of heightened hostilities between the rival Koreas, South Korea's Defense Ministry said a South Korean naval vessel fired five shots into the water as a warning Monday when a North Korean patrol boat briefly moved south of the countries' disputed boundary line in the Yellow Sea. Since its Jan. 6 nuclear test, which the North claimed was a powerful hydrogen bomb, despite outside skepticism, China and the United States have been negotiating the text of a new Security Council sanctions resolution. North Korean rocket launches and nuclear tests are seen as crucial steps toward Pyongyang's ultimate goal of a nuclear-armed missile that could hit the U.S. mainland. In an interview with CBS This Morning co-host Gayle King, President Barack Obama said: "I think we have been concerned about North Korea's behavior for a while. This is an authoritarian regime. It's provocative. It has repeatedly violated U.N. resolutions, tested and produced nuclear weapons and now they are trying to perfect their missile launch system. ... I spoke with President Xi of China just a few days before this launch about the need to really tighten the noose on them. But what we're also doing is consulting with the South Koreans for the first time about more missile defense capabilities to prevent any possibility that North Korea could reach U.S. facilities or U.S. populations." The president said he wasn't surprised that North Korea launched missiles over the weekend. "This is something that we have anticipated. We have seen a pattern of behavior over them," he explained. "They are not very good at feeding their people, but they invest a huge amount in their weapons systems." At the U.N., the U.S., backed by its allies, Japan and South Korea, wants tough sanctions reflecting Kim's defiance of the Security Council. But diplomats say China, the North's key protector in the council, is reluctant to impose economic measures that could cause North Korea's economy to collapse - and a flight of North Koreans into China across their shared border. The 15-member Security Council strongly condemned the launch and pledged to "expeditiously" adopt a new resolution with "further significant measures" - U.N. code for sanctions. The word "robust" referring to the measures was in an initial draft, but was dropped in the final statement. U.S. Ambassador Samantha Power told reporters that "it cannot be business as usual" after two successive North Korean acts that are "hostile and illegal." "What's important is that the Security Council unites," Power said. "China is a critical player. ... We are hopeful that China, like all council members, will see the grave threat to regional and international peace and security, see the importance of adopting tough, unprecedented measures, breaking new ground here, exceeding the expectations of Kim Jong Un." However, China's U.N. ambassador, Liu Jieyi, made clear that unprecedented sanctions aren't Beijing's priority. He said a new resolution should "do the work of reducing tension, of working toward denuclearization (of the Korean peninsula), of maintaining peace and stability, and of encouraging a negotiated solution." "I believe the council needs to work together for a new resolution," Liu added, indicating that China may want negotiations with the United States to be widened. Russia's U.N. ambassador, Vitaly Churkin, whose country is also a North Korean ally, said: "It has to be a weighty resolution, but it also has to be a reasonable resolution" that doesn't lead to North Korea's economic or humanitarian collapse, or further heighten tensions. Russia's goal is to see six-party talks aimed at denuclearization resume, he said, but in the current atmosphere that's unlikely because the North Koreans "have been very unreasonable" and are challenging the entire international community. "We think this is wrong for their national interests ... for the Korean Peninsula ... for the region," Churkin said.